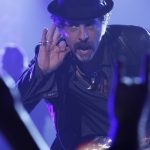 SDRR 1.4 “What You Like Is In The Limo” review: The Heathens are big in Belgium! The death hoax caused a resurrection of Johnny Rock mania, and the band (with a very reluctant Flash – John Corbett) is getting paid buckets of cash to do a show – that sells out in 7 hours! I learned a bit (or they did a really good job of convincing me of this aspect of rock concerts). The band had to choose what they wanted for their “rider,” that is, the backstage requests. Rehab (ironic name – John Ales) wanted non-FDA approved drugs. Ava (Elaine Hendricks) wanted a masseuse that looked like Johnny Depp. And 27 peaches? Gigi is not pleased. She wants it to be about the music. There’s a bit about family vs fame. First, Johnny feels torn between wanting the fame for himself and wanting it for Gigi. Ava is adorable, especially when she blurts out what she thinks. Flash wants Gigi to give up on Johnny because he’s convinced he will screw it all up. Johnny gets up on that stage and starts the song, “Die Tryin,” like a rock god. Then Bam Bam (Robert Kelly) starts an impromptu drum solo at the exact same time Johnny starts hallucinating (courtesy of blue weed, Rehab’s pill, an owl, and a snake – yeah… figure that out). He runs off the stage and Gigi saves the day. So… does Gigi go through with kicking him out? I do think this show would do well with an hour format. I am left wanting more, when it ends. That’s probably by design. I love the music too.